Celebrate Guillermo del Toro’s iconic 2013 film with this new release from NECA. Here’s the Pacific Rim Ultimate Striker Eureka, a continuation of the Ultra Deluxe Series by the acclaimed toymakers. He stands seven inches tall and features an open chest of rockets that is actually an interchangeable piece that swaps out to show a fiery missile launch! There’s even a nuclear payload that attaches to the back of the figure. 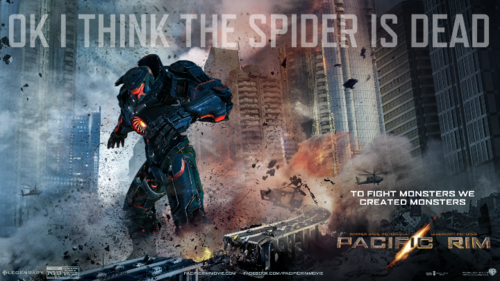 The Australian mech is made from the actual digital files utilized by ILM in the creation of Pacific Rim for exacting accuracy and detail. Click the image below to shop him now! Just in from NECA is this series six Reactor Blast Gipsy Danger, one of the most fearsome Mark-3 American Jaegers to cross the screen in Pacific Rim. Charged with the very important task of defending the coastline of Alaska against attack, this indomitable machine-soldier is essential for humankind to prevail over the kaiju. Generous articulation makes this guy an essential component of any Pacific Rim collection. What’s more, the left hand is removable and can be interchanged with that of the series four Hong Kong Brawl Gipsy Danger. Battle-damaged aesthetics and a re-tooling upgrade from series five render this seven-inch offering indispensable. Order now! Re-live the on-screen machine wars of Pacific Rim with this exclusive, deluxe, 18-inch Striker Eureka! This Down-Under, Mark-5 Jaeger was designed specifically to defend the Australian coastline from the onset of kaiju aggression. Powered by the father-and-son team of Hercules and Chuck Hansen, the Striker Eureka eventually proves its worth by successfully taking out 11 kaiju. Here, Striker Eureka is rendered in striking detail (pun definitely intended) in accurate 1/4-scale. The largest and heaviest Jaeger figure by NECA thus far, this guy comes to life with blue and red light-up LED features in his head and chest. The digital files used by ILM in the creation of the film were the inspiration for this Jaeger’s design, making him more realistic than ever. Generous articulation will let you re-create your favorite film moments. He’s in-stock now, so snap him up! Most people would agree that when your entire continent is under attack from a gigantic monster, you should probably build another gigantic monster to fight it. Right? That’s exactly what Striker Eureka from Pacific Rim was slated to accomplish, with the added bonus of it being the last Jaeger constructed and the only Mark-5 Jaeger ever. All the stops were pulled out for this dude in the movie, and so Sideshow has done the same with this 19-inch deluxe statue figure. The Skyscraping Soldier of Australia is ready to slice through both bone and steel with Sting-Blades. As this statue was crafted as a collaboration between award-winning director Guillermo del Toro and Sideshow Collectibles, the Striker Eureka looks like it just stepped out of the silver screen. Behold his intricately designed armor and paint deco, underscored by red and blue LED light-up features. Get your hands on this gorgeous statue before it’s too late! Kaijus are no match for this big boy. Valentine’s Day may have passed, but isn’t it kind of cute that the Cherno Alpha Mark-1 Russian Jaeger was piloted by the husband-and-wife team of Sasha and Aleksis Kaidonovsky? I mean, nothing says “love” like total and utter destruction. So aren’t we lucky that we’ve now got the whopping 18-inch Cherno Alpha from NECA’s Pacific Rim deluxe figure series? Third in a series that also includes Knifehead and Gipsy Danger, Cherno Alpha is a must-have to complete your deluxe Jaeger haul. NECA has cooked up some very tasty Pacific Rim Jaeger figures for us all, and we’re so stoked on them we could almost just destroy an entire urban core! Gipsy Danger 2.0 and Tacit Ronin are the two newest figures in this series, measuring seven inches tall and boasting over 20 articulation points, along with craftsmanship-like detail. Both Jaegers were designed using the actual digital files utilized by ILM in the creation of the film. You can’t get any more authentic than that — unless the giant monsters were to appear right in front of you, of course. We never say never over here at CmdStore! Snap ’em up together and save.